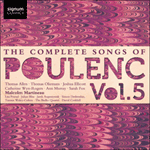 The Quatre poèmes de Max Jacob, composed in 1921, show Poulenc at his most avant-garde. To the already edgy ensemble of flute, oboe, clarinet, bassoon and trumpet Poulenc adds lines of dissonant counterpoint punctuated by knotty chords, to the point that two years later he claimed to have burnt the manuscript of a work ‘lost in the polytonality and other rubbish of the style of 1920’. On the other hand, at their first performance in January 1922 the songs were encored. One critic, interpreting them as ‘a kind of derision or coldly mystifying parody of all the known forms of musical pathos’, thought they might restore the precision and clarity of the French composers of the past; another, wondering whether all this dissonance would in its turn become the norm, and eventually old hat, admitted that ‘at least his work contains music, colour and life.’ A single copy of the manuscript survived in the archives of Darius Milhaud, who conducted the premiere, and the songs were not finally published until 1998. I would go to see you tomorrow. au bal, au bal, au baïkal allah! to the ball. to the ball, to Lake Baykal allah! je ne dis plus rien. et la fille du bougnat.